Have You Ever Wondered Why Some Dog Owners Treat Their Dogs Like Their Babies? While this might seem ridiculous to some, a study in Science proves the bond between dogs and their owners can be as emotionally strong as the connection between mothers and their children. It's the latest in a growing body of science that explains how dogs have gained such an important place in human society. "Owner-dog bonding is comparable to parent-infant bonding," writes Takefumi Kikusui, from Azabu University in Japan, via email. "And this is surprising to us … because there is not a reproductive relationship between humans and dogs." But any dog lover who has gazed into the big eyes of a pleading pup is not surprised. Previously, the researchers had shown the eye connection between dogs and humans increases the levels of oxytocin in people. Oxytocin, aka the "cuddle chemical," is a hormone mammals produce in the brain that encourages bonding between mothers and their offspring. It's also involved in partner and social bonding. Most evidence shows this kind of connection works within a species — humans produce oxytocin because of other humans, and dogs produce it because of other dogs. 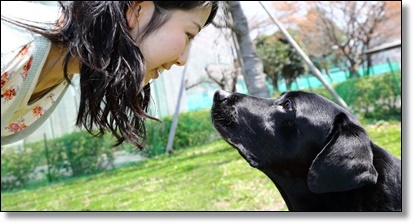 But this study is the first to show the hormonal bonding between dog and human. That is, the feeling is mutual. In the first experiment, the researchers measured oxytocin levels in 28 pairs of dogs and their humans before watching them interact for 30 minutes. People talked, petted and looked at their canines. Afterward, the researchers screened oxytocin levels again. 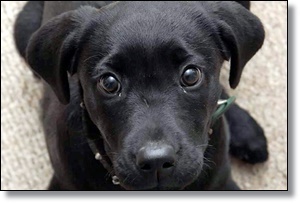 The owners and pups that gazed at one another more showed increased oxytocin. Humans "use eye gaze for affiliative communications and [are] very much sensitive to eye contact," said Kikusui. "Gaze, in particular, (over touch, for example) led to the release of oxytocin." For the second experiment, the researchers dosed 54 dogs with either a spray of saline or oxytocin in the nose. The female dogs treated with oxytocin spent more time gazing at their owners, which after 30 minutes boosted the levels of their owners' oxytocin. "[This] suggests that this gaze behavior is really critical in oxytocin release," said Evan MacLean, senior research scientist and co-director of the Duke Canine Cognition Center, who wrote an article about the findings. "When they receive oxytocin, this causes dogs to look more at people and the more they look, it boosts [oxytocin levels] more." What's more: Wolves, which dogs descended from about 30,000 years ago, do not experience an increase in oxytocin from gaze. "This means that dogs have acquired this superior ability during [the] evolutional/domestic process living with humans," says Kikusui. This provides more evidence of how deeply dogs are attuned to humans. "We make the claim that dogs might have hijacked [the oxytocin] pathway. It is in place in humans and we use this in our romantic relations and with children. And we know it is important," says MacLean. "This is sort of an accidental thing that happens over … time." "This special bonding relationship with dogs is fairly unique," he says.